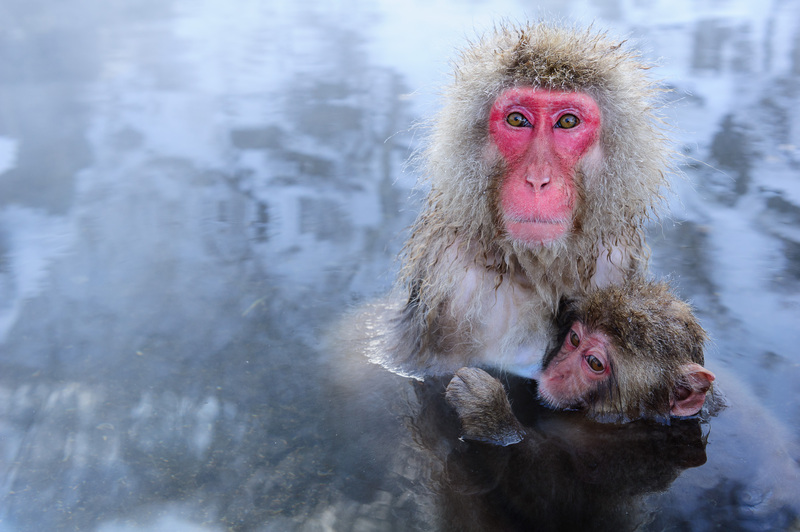 Japanese Macaques bathing in hot springs. 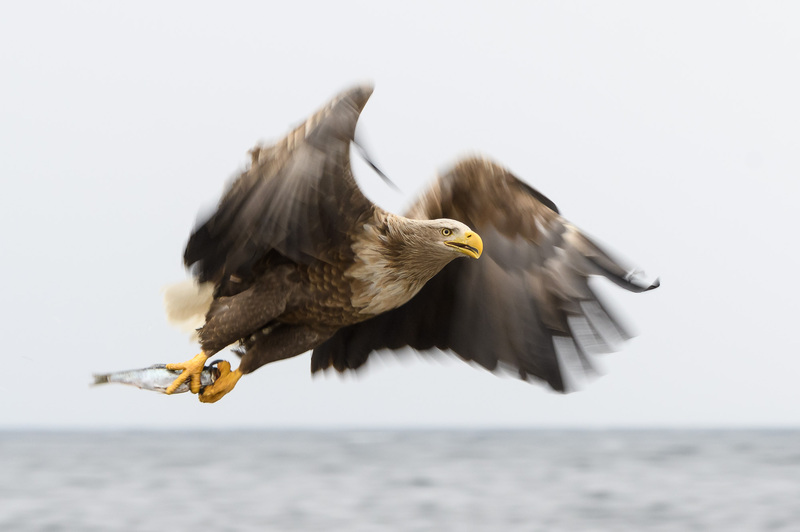 Three boat trips to the pack ice of the Sea of Ochotsk and close encounters with Steller’s Sea Eagle and White-Tailed Sea Eagles. 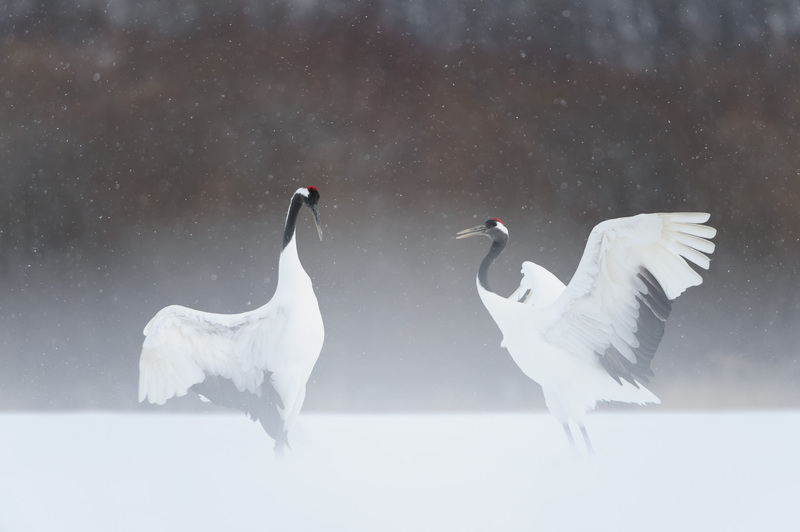 Red-Crowned Cranes dancing in the snow-covered landscape. The largest Owl in the World – Blakiston’s Fish-Owl. 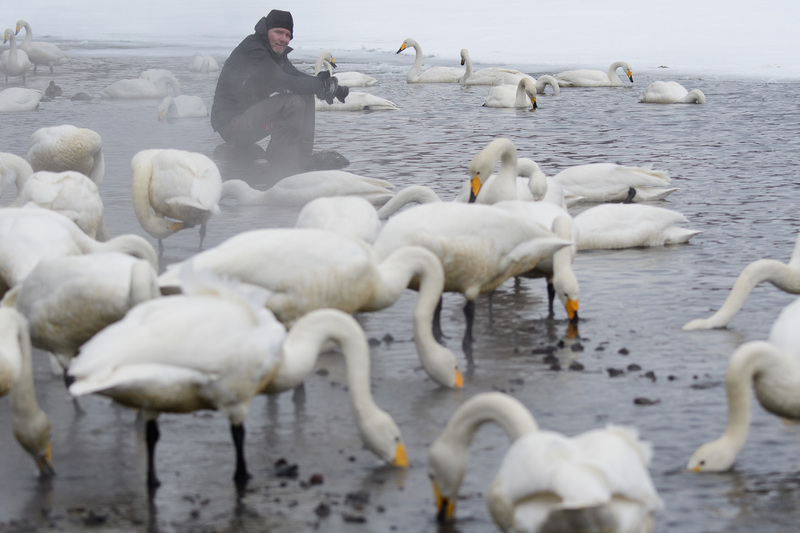 Hundreds of Whooper Swans spending the winter in volcanically-heated holes in the ice. Sika deer and foxes in a winter landscape. Traditional Japanese lodging, with hot-spring baths. The tour guide will show you all the best spots, and give photographic advice, in a small group. We promote conservation by economically supporting The Wild Bird Society of Japan. Visiting Japan in the winter time is a natural experience that lacks comparison. 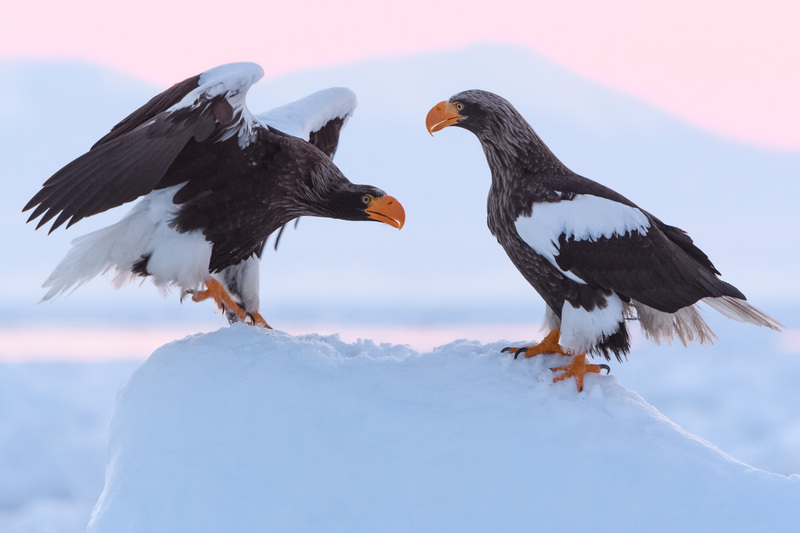 Japan provides us with a snow-covered mountain landscape that not only gives us amazing opportunities for landscape photography, but also a beautiful background when we photograph animals and birds. We will have unique encounters with Japanese Macaques, Steller’s Sea Eagle, Blakiston’s Fish-Owl, as well as the national bird of Japan, the Red-Crowned Crane. We will often get very close to the animals and be able to get spectacular pictures. Japan also offers a fantastic cultural experience. Abundant Shinto temples show that religion is practiced all over the area. We will also visit traditional Japanese guesthouses, so-called ryokans. Our accommodation will often have traditional onsen baths, filled with water from hot springs. Japanese food is of very high standard, and we will be served traditional food during the tour. 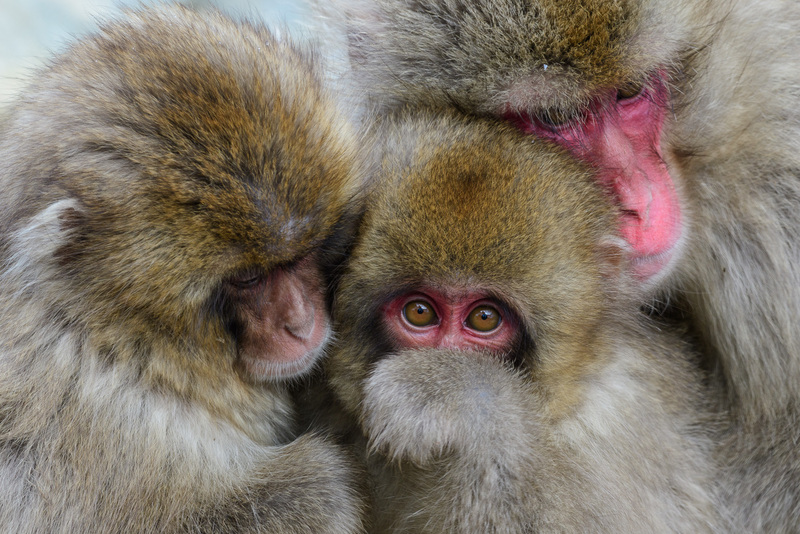 The photo tour is planned in order to give us the best opportunities to photograph the iconic wildlife of Japan. 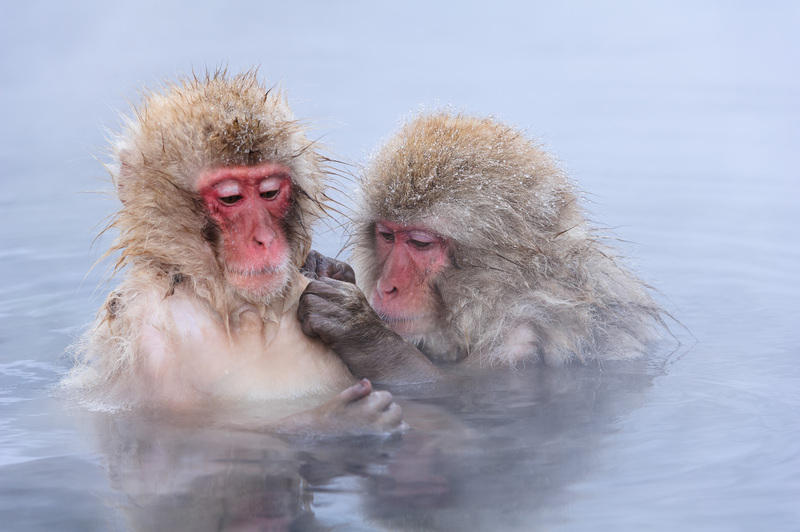 From Tokyo we will head towards the Japanese Alps to photograph the Japanese Macaques bathing in the hot springs. Our journey will then take us on to the northernmost island in Japan, Hokkaido, where we will amongst other things see the national bird of Japan, the Red-Crowned Crane. In Akan National Park we will have close encounters with not only the Red-Crowned Crane but also numerous Whooper Swans and hopefully our first meeting with Steller’s Sea Eagle. 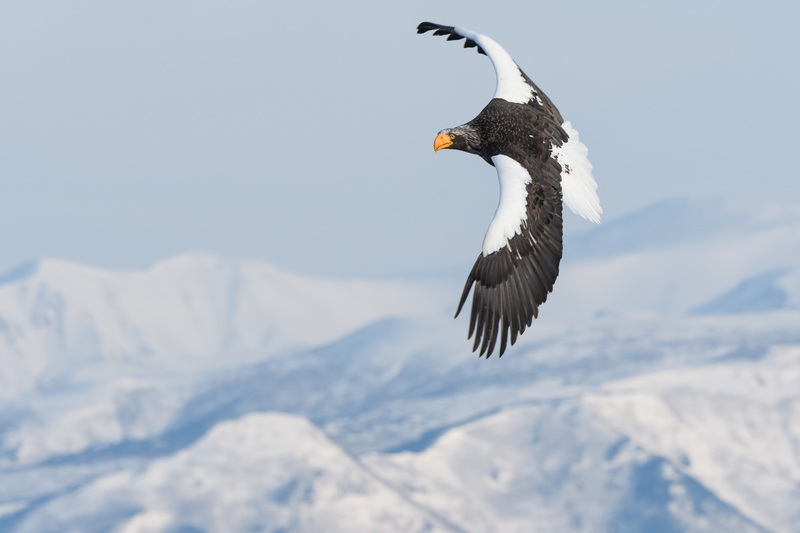 On the Sea of Ochotsk we head out on to the pack ice, encountering hundreds of Steller’s Sea Eagles and White-Tailed Sea Eagles. The landscape is often spectacular, providing excellent opportunities for landscape photography. In the mountains north of Nagano lies Jigokudani, or ”The valley of Hell”. The Yokoyo River runs through the valley, originating from hot springs. 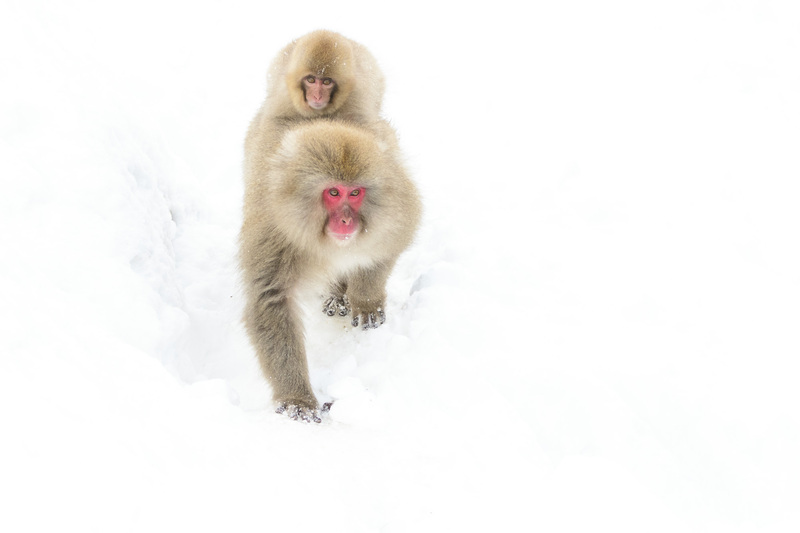 We will be there to photograph the famous Japanese Macaques, also known as Snow Monkeys. With a little luck we will also be witness to snow-ball fights between younger monkeys. There are often good opportunities to photograph young ones sitting with their mothers. The monkeys are quite unafraid and we will be able to get all sorts of images. Having left the Japanese mainland, Honshu, we head for the northernmost island, Hokkaido. Our first aim here in the north is the Red-Crowned Crane, or Tancho, as it is called in Japanese.Today there are only 2500 of these birds left in the World. 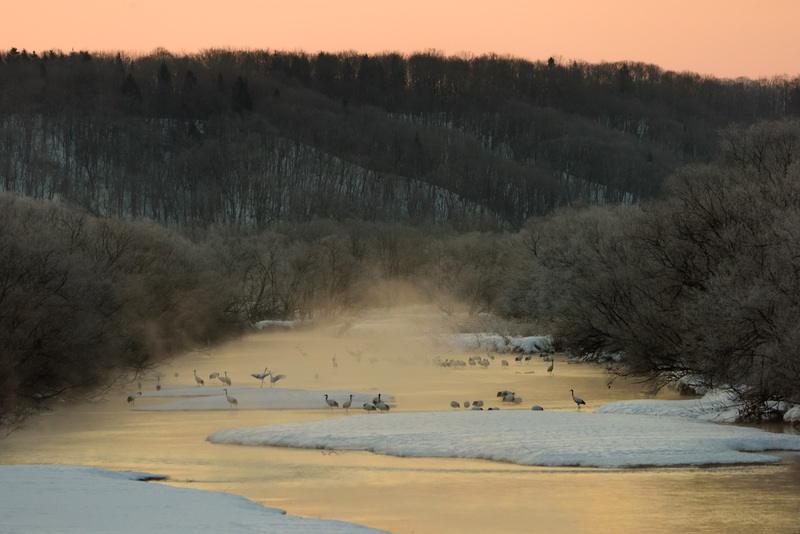 The area around Kushiro is the best place in the World to see and photograph these beautiful birds, with half the World population residing here. During winter the birds are fed at a number of sites, providing excellent opportunities to photograph them. Depending on weather and light conditions we will select different spots for photography. 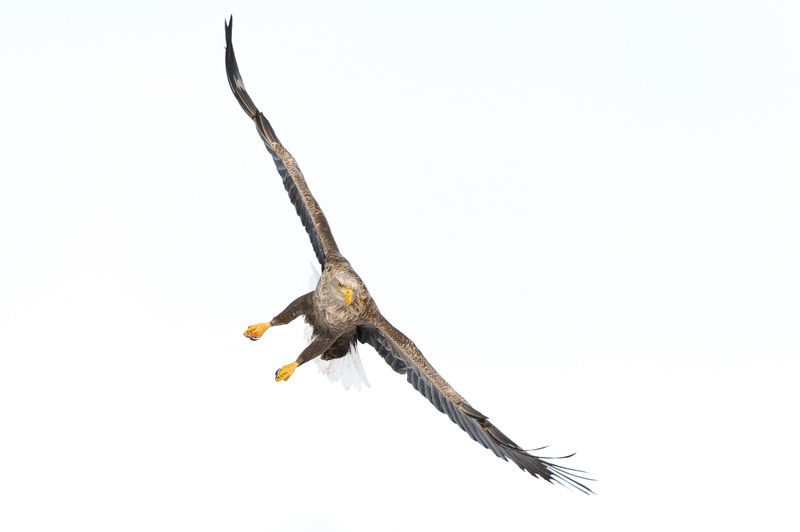 At Akan International Crane Center there is also opportunity to photograph Whooper Swans, Black Kites, White-Tailed Sea Eagles and hopefully our first encounter with Steller’s Sea Eagle. 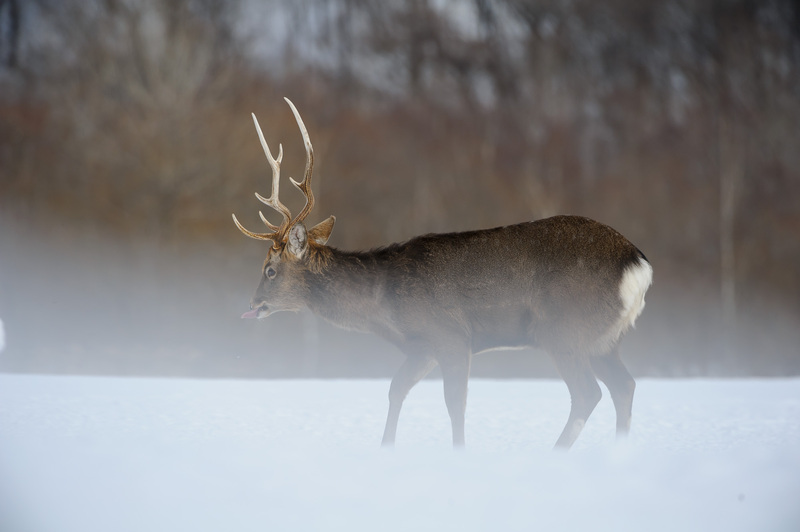 Mammals also visit the area, mainly Sika Deer, but foxes are also regular visitors. From Kushiro we head for Japan’s largest crater lake, Lake Kussharo. During winter-time the lake freezes over except for some spots kept open by warm water from hot springs. 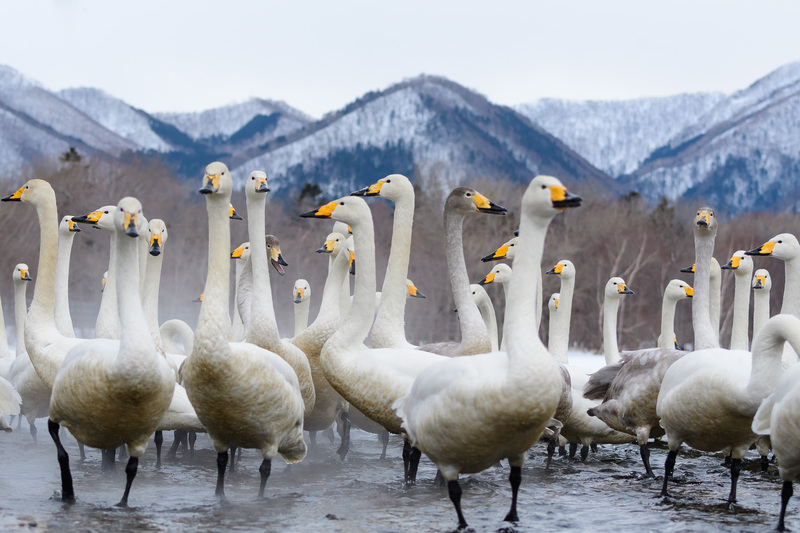 Here, hundreds of Whooper Swans spend the winter. The birds are unafraid and can be photographed with a wide-angle lens to include the landscape in the background. Weather-permitting, we will head up the Bihoro Pass to photograph Lake Kussharo from above. With a bit of luck we will see flocks of Whooper Swans flying in towards the lake. We will also visit the volcanic area of louzan (sulpher mountain). The harbor town of Rausu will be our base for two days. 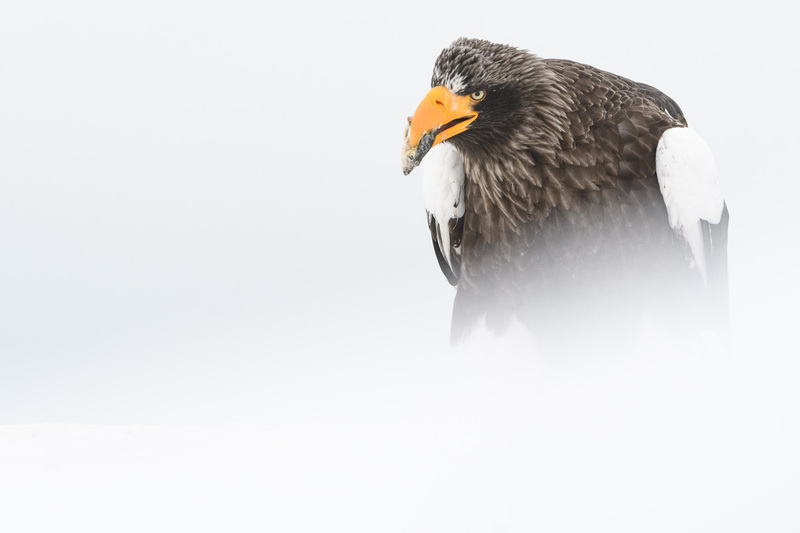 Our main objective is to get out into the drift ice to meet the Steller’s Sea Eagle. 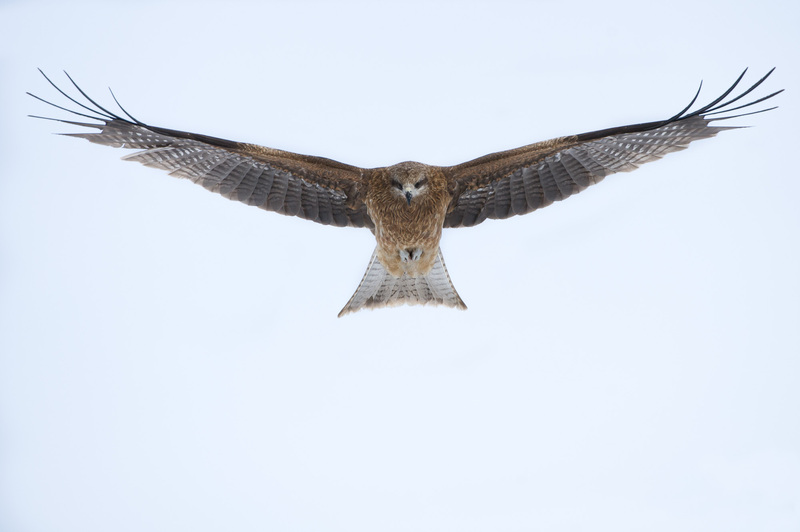 During winter, a large part of the population that nests on the Kamchatka Peninsular can be found on the drift ice of the Sea of Ochotsk. 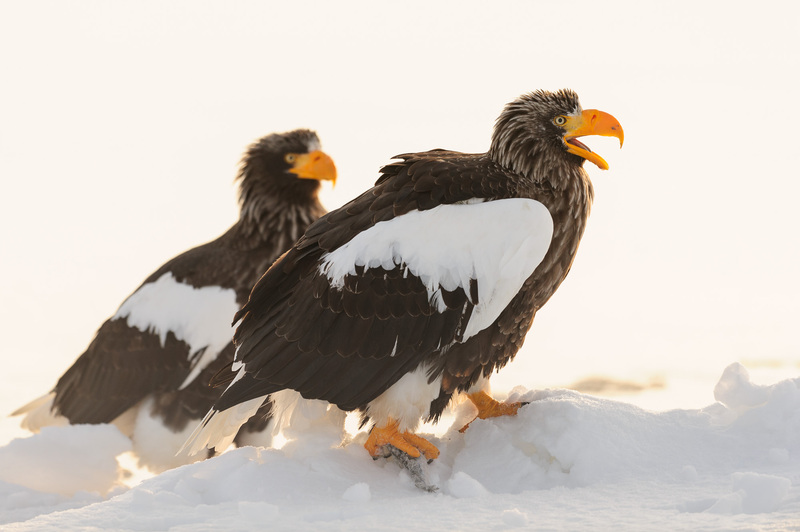 In February, the drift ice is mostly north of Rausu, and provides great opportunity to experience hundreds of eagles, both Steller’s Sea Eagle and the ”ordinary” White-Tailed Sea Eagle. 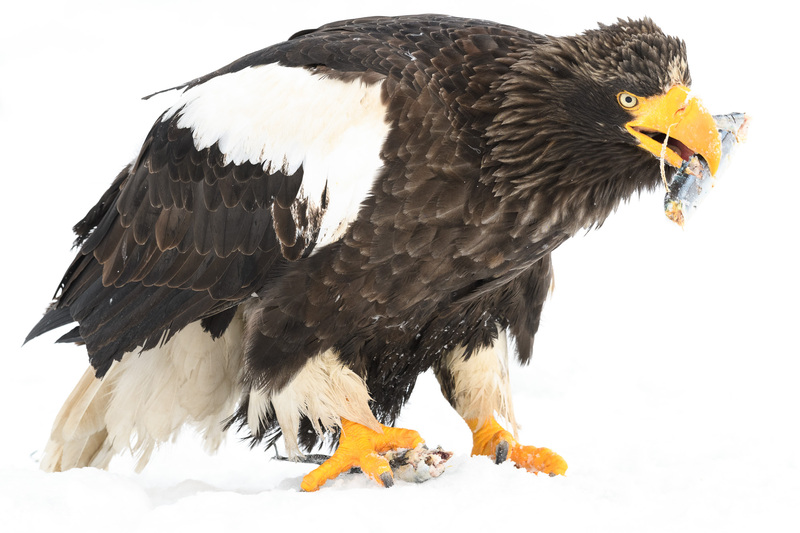 We will do three trips to explore the drift ice by boat to photograph the eagles. As the birds are fed with fish, we will often be within a few meters from them, and they are quite unafraid. Our afternoons will be spent doing landscape photography in and around Shiretoko National Park. Here, there are several volcanoes protruding out of the rocky landscape. We select our spots for photography depending on the day’s snow conditions. Someday will we go out on to the Netsuke Peninsular in search for Sika deers and Red foxes. Japanese winters provide a landscape with masses of pack ice and snow. During our stay in Hokkaido we will stay at a place where we hope to photograph the Worlds largest Owl, Blakiston’s Fish Owl. A ”pool” is kept open in a stream, and the owl visit the stream almost every evening or night. Here will we also have the opportunity to photograph smaller birds at a feeding station. If we are lucky will the Hokkaido Sabel, a marten, pay us a visit. This tour is not only for the most dedicated nature photographer, but also for those who wish to experience some of the finest National Parks in the World, with wildlife at close range, in spectacular surroundings. During the tour we will have time for photographic workshops, e.g. covering techniques for the following days photography. We will also cover composition and look at each others images, all in order to improve your photography. Share in twin room and meals according to itinerary. All entrance fees, all boat safaris, photo workshops, local transports (4 wheel drive cars), transfer to and from Haneda airport. Accommodation in hotels, ryokans (traditional Japanese guesthouse) and lodges of middle standard. Flights in and out of Tokyo Haneda airport, domestic flight Tokyo – Kushiro (return trips), insurance, cancellation insurance, beverages, meals that are not specified in itinerary, phone and internet charges, personal items. Haneda international airport, Tokyo. The tour starts and ends here. A wide range of subjects will be available to us, from landscapes to mammals and birds. Therefore it is good to bring everything from wide-angle to telephoto lenses. For some of the species we will photograph during the tour we will be able to get really close. This makes wide-angle zooms a perfect lens even for wildlife. 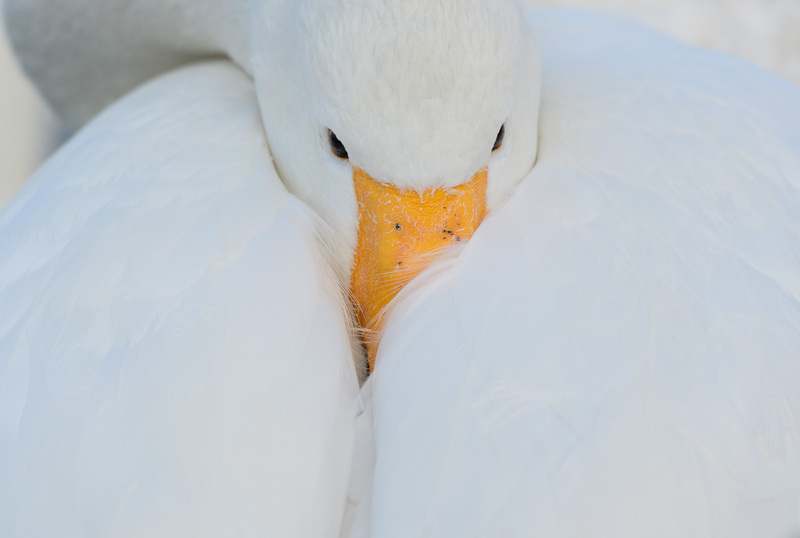 Lenses from 70-200 mm up to 500 mm are excellent for the wildlife that we will encounter. To increase focal length you can use a teleconverter. Snow fall are likely during the tour so bring some protections for your cameras and lenses. If you have two camera bodies, bring both in order not to have to change lenses as much. Tripods will be useful in many situations, especially at the Crane feeding stations and while shooting landscapes. The temperature in the parts of Japan that we will visit can in February and March can vary from some degrees above freezing to well below (approx +5 – -20 degrees Celsius). You need proper winter clothing and winter boots. Flight to Tokyo Haneda international airport. Arrival at Tokyo Haneda International Airport. Transfer to Yudanaka. Evening photo workshop. After breakfast we go to Jigokundani Yaen-koen in order to photograph the Japanese Macaques bathing in hot-springs, playing in the snow etc. We spend both days with the Macaques. In order to get to Jigokundani Yaen-koen we need to walk about 1.5 km along a forest trail. After breakfast we return to Tokyo and Haneda Airport. In the evening we fly to the island of Hokkaido and the city of Kushiro. Transfer to hotel. 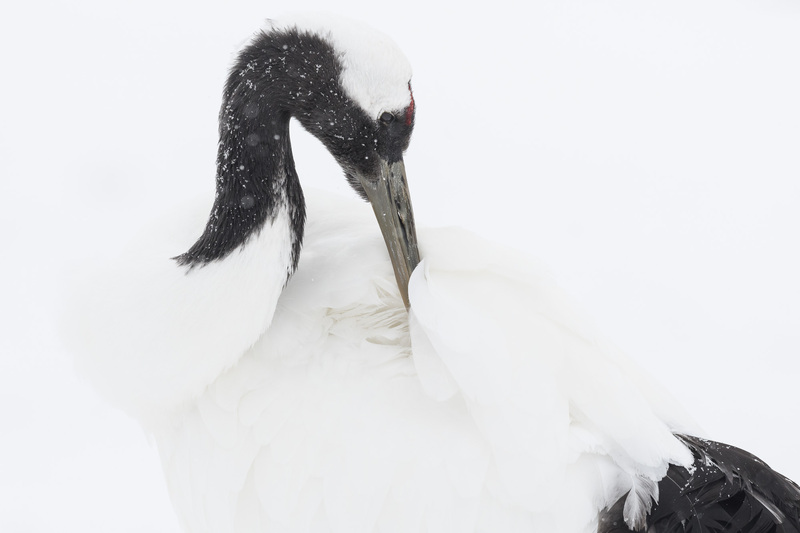 We spend the whole day photographing Red-Crowned Cranes. For the morning session we choose the best sites according to weather. We will spend some of the day at the different feeding stations for cranes. 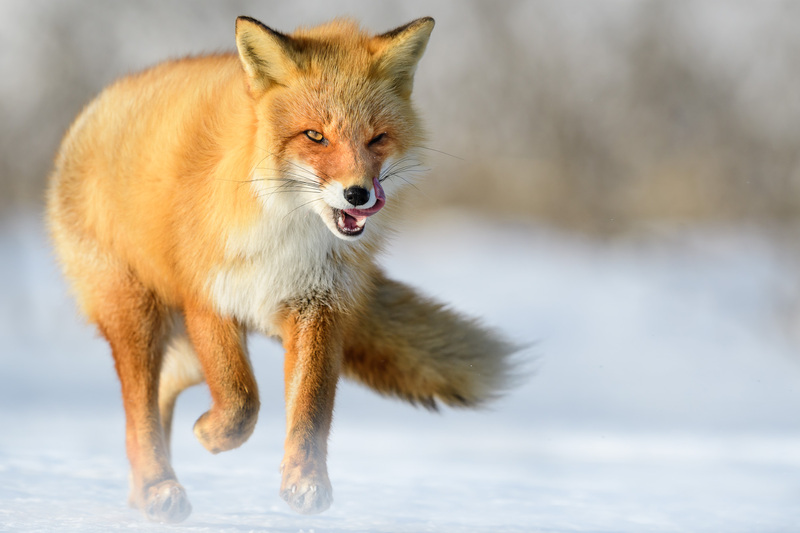 There, you can photograph Whooper Swans, White-Tailed Sea Eagles, Sika Deer and Fox. Just like the previous day we photograph Cranes in the morning. After an early lunch we head for Lake Kussharo, stopping on the way to photograph landscapes when there is an opportunity. 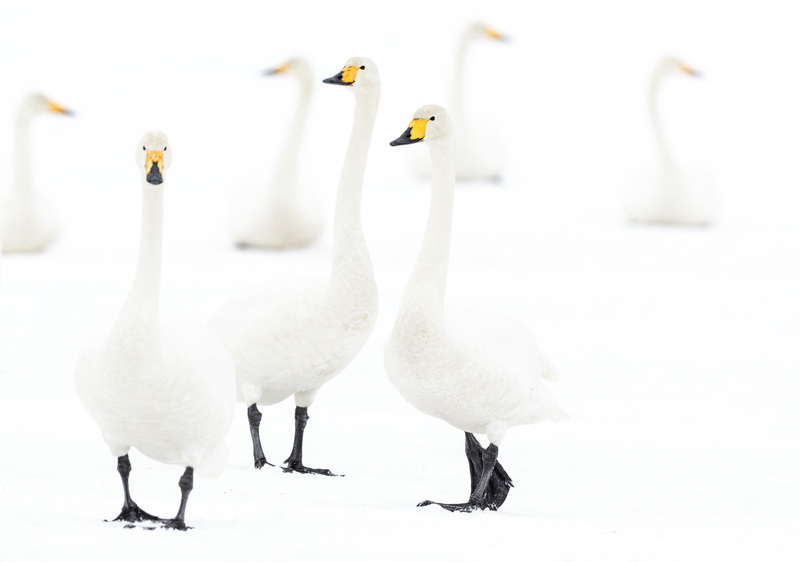 Depending on when we arrive at Lake Kussharo there will be a chance to photograph Whooper Swans. 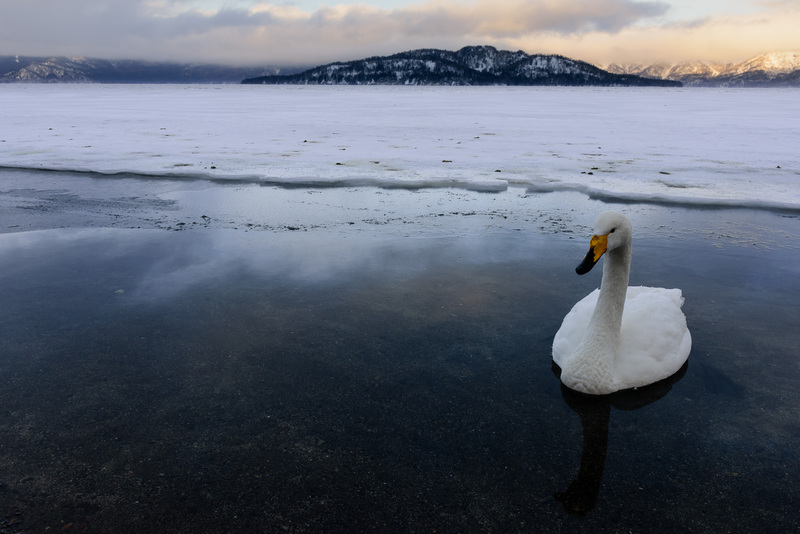 We spend the day by and around Lake Kussharo, photographing Whoopr Swans at different sites. If weather and road conditions permit we will go to the Bihoro Pass in the morning for some landscape photography. Depending on weather and the results of the previous day’s photography we might head for the Bihoro Pass in the morning. The rest of the morning is spent at Lake Kussharo photographing Whooper Swans. After lunch we head for Rausu. On the way, we stop at louzan, Sulphur Mountain. The area is volcanically active and there is a chance to photograph sulphur springs and other volcanically active things. 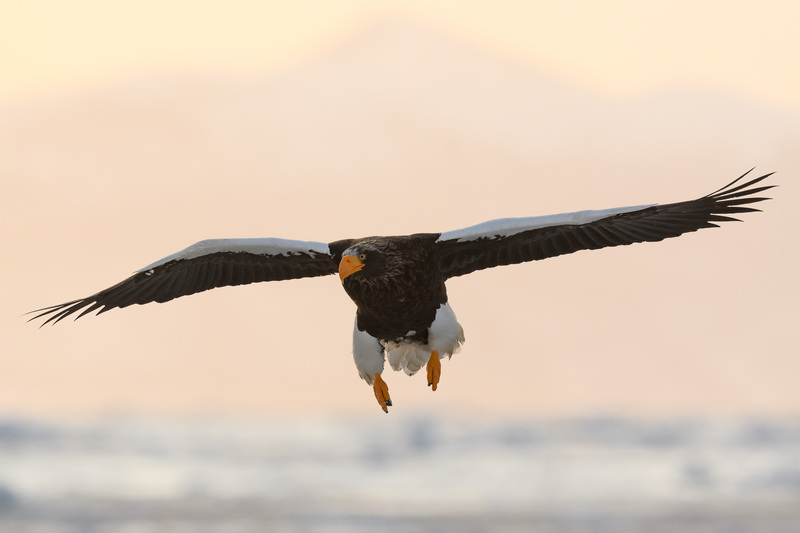 The day starts with a boat trip on the Sea of Ochotsk to photograph both Steller’s Sea Eagle and ”ordinary” Sea Eagles. Afternoons will be spent searching for exciting birds in harbors and going to Netsuke Peninsula to look for Sika deers and Red foxes. On the 26th February will we leave Rausu and make our way to Nakashibetsu and our hotel. 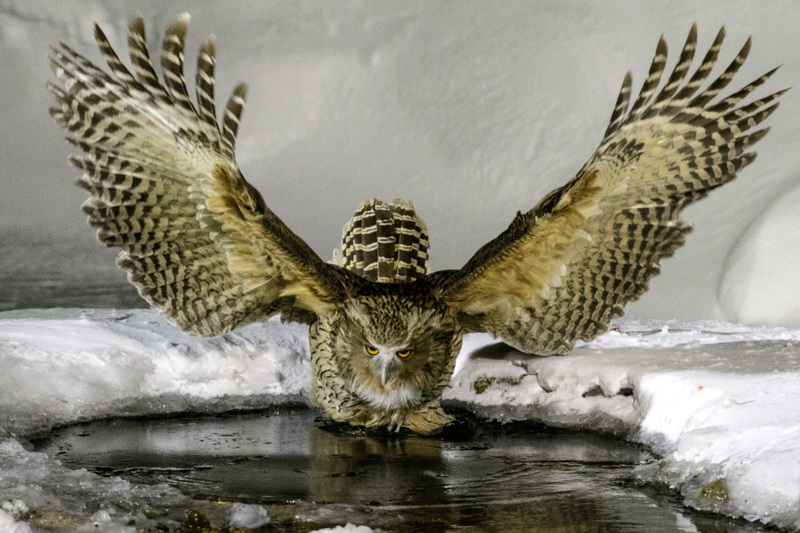 Here will we have a chance to photograph the world’s largest owl, Blakiston’s Fish-Owl. Today will we do some landscape photography or go to Notsuke Peninsula. At the hotel there are bird feeders that attract lots of bird. Sometimes the Hokkaido Sabel, a marten, pays a visit to the hotel area. We will also try to photograph the Blakison´s Fish-Owl again. After breakfast will we start our journey back to Kushiro. In the afternoon we fly to Tokyo Haneda airport and then back home.